Like all our prior blog posts, this post takes a moment to memorialize the results we received on the most recent blog poll. 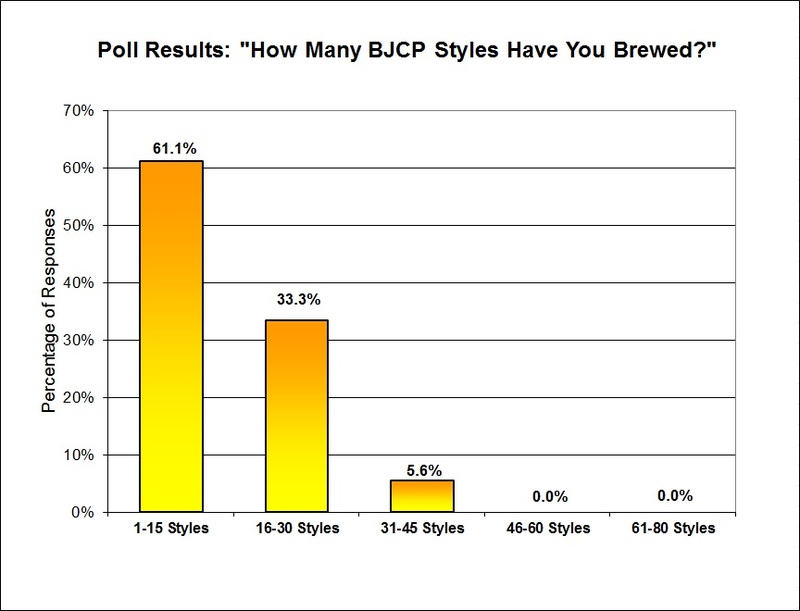 The readers' responses to the question "Of the 80 BJCP Beer Styles, How Many Have You Brewed?" are presented below. 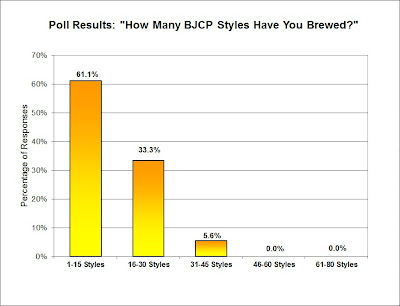 More than a majority of the voters have only tried homebrewing a handful of beer styles. If we setup another poll that asked which styles people have brewed, the prototypically styles would be the most prevalent (i.e. APA, IPA, ESB, English Brown, etc). The other question that is bouncing around my mind is whether the voters who voted are relatively new to homebrewing and hence the 1-15 styles brewed, or if they are old hands at homebrewing and prefer only brewing their favorite styles. On the other side of the coin, I was surprised that the maximum number of styles anyone who voted was 31-45. I was certain there would be folks in the 46+ range, but we never got a single vote. It made for a very skewed result. After rolling up my own "Styles Brewed" list, the idea of expanding my styles has weighed on my brewing plans. Let us know what styles you may want to try in the near future.